The 1060 Brickell Avenue condo is one of two Brickell condos for sale by SB Architects and New York based Extell Management and Investment Company located directly on the famous roadway, the 1060 condo being the taller of the two at 46 stories. You'll find one to three bedroom units as well as loft style studios when exploring the residential options of this building. A cigar lounge, wine room, fitness center, swimming pool, 1060 Brickell Avenue has all you need to complement the experience of living in the trendy Brickell area. The 1060 Brickell units range from 890 to 1,356 square feet and include features like spacious terraces/balconies plus modern appliances, walk-in closets and broadband pre-wiring. Enjoy scenic vistas of the Miami cityscape from the comfort of your stylish 1060 Brickell home. 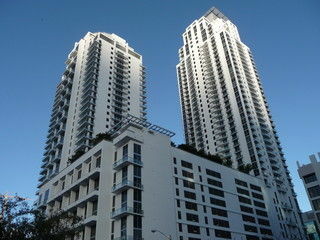 Mary Brickell Village is one of the many highlights of the Brickell area and choosing the 1060 Brickell Avenue condo. Here you'll find several shops, bars and restaurants or you can explore what else is nearby like the downtown area of Miami to the north or the island of Key Biscayne to the southeast which has beaches and parks. The Metromover can be walked to from 1060 Brickell and provides an easy way to get around without a vehicle.